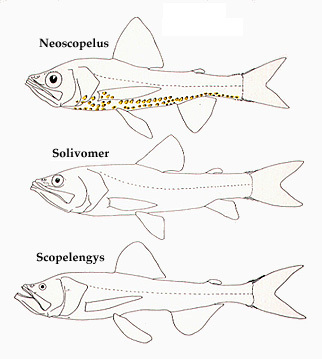 Composed of three genera, Neoscopelus (with two species in the North Atlantic and one restricted to central and southern Japan), Scopelengys (with one species widespread in all three oceans and another restricted to the central North Pacific) and the monotypic Solivomer (Philippines), the Neoscopelidae is a small assemblage of poorly known deep-sea pelagic and benthopelagic fishes. Little is known of the biology of the neoscopelids, and perhaps the most noteworthy thing about them is their generalized anatomy. While this anatomical conservatism makes for a difficult task in attempts to resolve their intrarelationships it renders them a very useful source of outgroup data for studies of the relationship within the large and species-rich Acanthomorpha. The most recent summary of what is known of the taxonomy and distribution of the Neoscopelidae is presented by Nafpaktitis (1977). Members of the genus Neoscopelus are noteworthy in that they are the only neoscopelids that possess photophores (a feature widespread among myctophid species, see below). The photophores of Neoscopelus are arranged in a single series along the periphery of the tongue, and in a mid-ventral and several bilateral series along the trunk. Representative neoscopelid fishes. Top, Neoscopelus macrolepidotus, middle, Solivomer arenidens, bottom, Scopelengys tristis. Drawing by M.L.J. Stiassny. Brauer (1908) was the first to investigate the histology of neoscopelid photophores (see figure, below) and he noted certain structural difference with myctophid photophores. Sagittal sections through trunk photophores. Top, Neoscopelus macrolepidotus; bottom, a myctophid, Lampanyctus lacerta. However, despite these morphological differences, Brauer (1908) was of the opinion that the basic similarity of their cellular composition was indication that the two organs bear an essential correspondence. More recently, both Johnson (1982) and Paxton et al. (1984) revisited the question of the neoscopelid and myctophid photophores and both note that the differences in gross morphological structure between the two systems are suggestive an independent acquisition of luminescence in these two lineages. Despite their rather characteristic appearance Stiassny (1996) was only able to find two characters (the presence of a trilobate rostral cartilage, and an elaborate and extensive gap between the back of the neurocranium and the first cervical vertebra) corroborating neoscopelid monophyly. Prior to Stiassny's (1996) study no explicitly phylogenetic hypothesis of neoscopelid intrarelationships had been proposed. 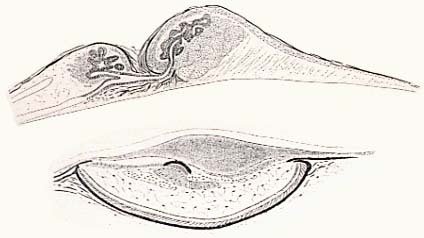 Nonetheless, the consensus of most authors has been that Scopelengys with its "weakly ossified skeleton, small eyes, flabby musculature, lack of photophores, and lack of swimbladder" is a specialized "offshoot" from the main neoscopelid line, and that Solivomer represents an intermediate between the "vigorous" Neoscopelus and the "degenerate" Scopelengys. However, as Stiassny (1996:415) notes "Whether or not the standard scenario in which the sluggish, energy-deprived, deepwater Scopelengys is derived from an active benthopelagic and luminescent Neoscopelus-like ancestor (Nafpaktitis, 1977) is reasonable is, at this point, moot. Nonetheless, the fact that Scopelengys is so weakly ossified and degenerate makes an assessment of the precise intra-relationships of these three genera problematic." Accordingly, while Stiassny (1996) found some derived anatomical features linking Solivomer and Neoscopelus, she noted the possibility that these may, as a result of reductive processes, in fact be secondarily absent in Scopelengys. Brauer, A. (1908). Die Tiefsee-Fische. II. Anatomishcer Teil. Wiss. Ergeb. Dtsch. Tiefsee-Exped. Dampfer "Valdivia" 1898-1899 15, 266 p.
Johnson, R.K. (1982). Fishes of the families Evermanellidae and Scopelarchidae: Systematics, morphology, interrelationships, and zoogeography. Fieldiana, Zool. (N.S.) 12: 1-252.
. Nafpaktitis, B.G. (1977). Family Neoscopelidae. In "Fishes of the Western North Atlantic". Sears Found. Mar. Res., Mem. No. 1, Part 7: 1-12. Yale University, New Haven, CT.
Stiassny, M.L.J. (1986). The limits and relationships of the acanthomorph teleosts. J. Zool. (B) 1: 411-460. Stiassny, M.L.J. (1996). Basal ctenosquamate relationships and the interrelationships of the myctophiform (scopelomorph) fishes. In "Interrelationships of Fishes" (Stiassny, M.L.J., Parenti, L.R. and G.D. Johnson, eds). Academic Press, San Diego, CA.